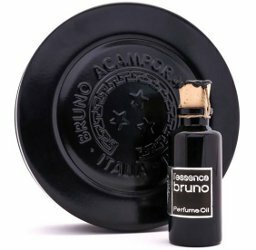 Italian niche line Bruno Acampora has launched Bruno, a new unisex fragrance. From ACAMPORA, famous for its acclaimed Musc, a woody and spicy fragrance, along the finest natural Oud route: BRUNO. It is a new unisex creation, loosely based on the house’s most successful Nero, totally reformulated. Rounder and smoother, hand blended with the finest raw materials, BRUNO remains in the olfactory tracks of its predecessor, while achieving a new level of perfection when the delicate Rose petals melt with refined woods and patchouli. Exploring as usual a gorgeous palette of olfactory sensations, BRUNO is a complex and quintessential unisex fragrance, uniting opposites, fresh and sensual at the same time. An Oriental-Floral-Woody-Musky blend, modern yet of classic appeal. Bruno by Bruno Acampora is available in 5 and 20 ml Perfume Oil (shown) or 30 ml Extrait. Heard good things about their jasmine scent but haven’t tried anything from this line.